Whats New | Wood Preservers Inc.
McFarland Cascade is proud to announce it has acquired the assets of Wood Preservers, Inc. in April 2018. The business will continue to operate as it has. The management team will remain in place as well as the sales team. Please visit our McFarland Cascade website at www.ldm.com or our parent company Stella-Jones website at www.stella-jones.com. Success with our clear Strong-Seal® fiberglass composite wrapped piling and timbers has lead us to introduce colored Strong-Seal®. 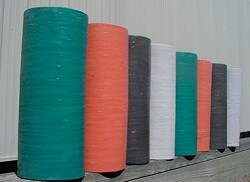 We pigment our resin to get uniform color throughout the Strong-Seal® fiberglass wrap in any color that you desire. You pick the color, Red, Black, Green, Grey, Pink, Tan, Brown, Blue, Clay, or any other that you would like. Please visit our Strong-Seal® fiberglass composite web page for more information on this material. Just give us a call and we will get you the color that you want!